The unique sales proposition of a steel belt conveyor lies in its physical form: no other material can compete when it comes to a steel belt’s baking qualities. Not only does it deliver reliable operation in applications where temperatures can reach as high as 400 °C, but it also does so with outstanding reliability and durability. A working life of 20+ years is not unusual. Excellent product support for a wide range of baked products – biscuits, pastries, sponges and bread. Hard smooth surface for clean product release. Hygienic and more easily cleaned than wire mesh belts means less down time. Excellent thermal conductivity for good baking performance and consistent product quality. Faster belt speeds increase production output. No stretching, good tension and tracking characteristics mean lower maintenance vs wire mesh belts. Less energy needed than heavier wire mesh belts, lowering production costs. Wide belts up to 3 500 mm for maximum productivity. The good tension and tracking characteristics – and resistance to stretching – of steel conveyor belts result in low maintenance requirements. And exceptional durability means a working life of 20+ years is far from unusual. 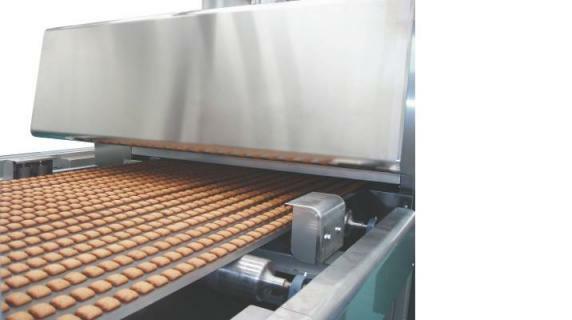 Solid/perforated steel belt conveyors for bake ovens deliver exceptional performance in terms of bake quality. Much of this is due to the excellent heat transfer and thermal conductivity of the belt, but its stability is also key: a solid or perforated steel belt keeps its shape and stays flat as it passes through the intense heat of the oven, resulting in consistent product quality. A flat, smooth surface also ensures easy discharge. Solid steel conveyor belts are lighter than wire mesh – perforated steel belts lighter still – so cost up to 30% less to heat. Each time the steel belt conveyor exits the baking chamber, it begins to cool and has to be heated up again so the savings are continuous. As much of 25% of an oven’s energy consumption is needed to heat the belt, so the savings can be considerable. This weight advantage also means less energy is needed to ‘drive’ the belt through the oven. A solid steel belt has the major advantage of having no gaps, recesses or crevices in which carbon deposits could collect. And this flatness also means that cleaning operations are simpler, faster and more economical than for other materials, with savings in water and detergent of up to 25%. IPCO’s ability to produce steel conveyor belts in widths from 800 mm to 3 500 mm enables improvements in productivity without having to invest in factory extensions or new facilities. An oven with a 1 500 mm wide belt offers almost 2x the productivity of one with an 800 mm belt without any increase in line length. Upgrade to an oven with a 3 200 mm belt or larger and throughput is increased by a factor of four. Conveyor end stations: A full range of components including bearings, conveyor break points, drive and tension shafts up to 1 500 mm, and sheaves for short or low loaded conveyors. Conveyor skid bars: Special cast iron skid bars that support the bake oven belt. For optimum belt performance and reliability, we recommend that a minimum of 10% of the skid bars should be graphite. Conveyor tracking solutions: We offer a range of active and passive belt alignment solutions including belt edge detectors, guide rollers and compact/automatic tracking devices.